Well, today is our final post, and I’m breaking it up into three parts. Part 1: First, I’d really like to thank all of you for reading our posts this week. We have tried to keep Mary’s Meals at the forefront of our efforts, and I’m so glad that we have also had the chance to engage in discussions about available food choices, portion sizes, what “healthy” really means, etc. It’s been difficult for a group of adults, who all enjoy different kinds of lunches for different reasons, to try to create posts that appeal to both children and adults, and we do appreciate all of the comments and criticism, because how else can we learn and improve? Everyone in our group truly loves language, and we’ve had fun using regional colloquialisms- y’all, for example- and even playing with the idea of what “American” food is. I know yesterday’s writer tried to add some humor to that subject. We are just a handful of students at a single university who love learning, writing, and occasionally a bit of silliness among other things. I’m including a link to Texas Tech so you can see pictures of the university and its surrounding landscape. As a comment on yesterday’s post mentioned, The United States is a vast and varied land. I have been fortunate enough to have lived and studied in many beautiful cities across several states. Our landscapes, culture, arts, lifestyles, and yes, food have myriad variations. Even the members of our small group of writers have had the good fortune to meet because we came to Texas for graduate study from all over the country. I’m not sure that there is anything that is “typically American,” other than a love of individualism and diversity, and hopefully we’ve managed to bring just a small amount of that to you this week. We truly and from the bottoms of our hearts thank you, VEG’s Dad, and most especially VEG herself for allowing us this opportunity of a lifetime. Part 2: Now, after a bit of seriousness, here is “Sunflower Gal” -who studies art, arts administration, and playwriting- with today’s food review! Just call me Sunflower Gal, since I’m from Kansas. I’m a grad student here at Tech, and I eat on campus frequently. Today I went by one of my favorite places, the Einstein Bros Bagels location in the Jerry Rawls College of Business building, or the new BA, as we call it around here. This location has been running since the building opened at the beginning of the spring semester. I was pretty excited to discover it, because not only do I have to walk right past the new BA every day I’m on campus to get to where I need to go, I’m also a big fan of their coffee, not to mention the bagels. Usually I’m there in the mornings, getting my coffee and an everything bagel, lightly toasted with light cream cheese. That’s light as in lower calorie, not lightly spread. I even ended up buying an Einstein Bros Bagels coffee travel mug, which has come in very handy. Today I stopped in on my way home from campus to pick up lunch. While I did buy my lunch on campus, I brought it home to eat because I’d already spent most of my day on campus at work. Once I get off work I’m ready to leave campus and get home. I purchased a turkey, bacon, and avocado sandwich. You can have a sandwich on any type of bagel, but I usually choose the bagel thin option, wheat. I love bread, hence my love of bagels, but not a lot of bread when I’m having a sandwich. 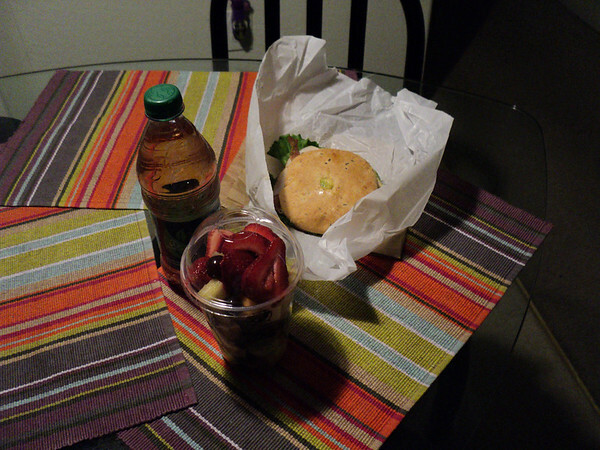 I also bought fresh fruit and a bottle of water. When I got home I flavored my water with MiO’s peach tea flavor liquid. It’s 0 calories, has 0 sugar, 0 fat, 0 sodium, and makes my water taste great. What’s not to like? The sandwich had turkey breast, fresh avocado, sliced tomato, bacon, and lettuce on it, and it was yummy! Part 3: CJ again with one final thought. 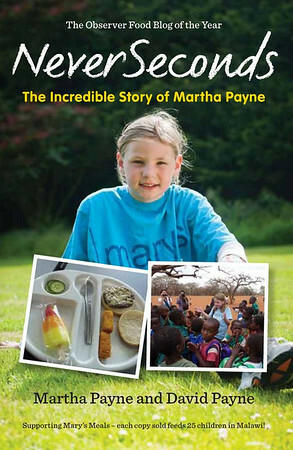 We do again encourage the readers of this blog who are able to, to support VEG in her efforts to end hunger through Mary’s Meals and the Just Giving page. We also wish to remind readers that sadly, hunger exists everywhere, and I’m including links to The South Plains Food Bank of Lubbock and the SPFB Kids Café pages, so that you all can see some of the efforts taking place where we live to make sure that no family, and especially no child, has to go hungry. Again, thank you for reading our posts, and we now pass the torch back to a group of bloggers reviewing their little ones’ lunches from around the world! Oh dear, MiO products are artificially sweetened + contain ingredients banned in several countries. I also don't understand why you need to buy water when you're going to be consuming it at home? I think, sometimes, it's a matter of where you live when it comes to buying water. I have no problem drinking from the tap, or using a filter for some of the places I lived, but in one apartment, my water was orange. It caused me to develop skin infections, and around my nails and other places quickly developed infections from bathing and cleaning my dishes. I don't think any filter would have made me comfortable enough to drink that water. I refused to even give it to my dog. And my landlady refused to do anything about it. My water here sometimes smells like sulfur, and it has an off flavor. And due to my living situation, a filter is just not an option. So I buy my water. I'm hoping to move again very soon and hope to be able to just use the tap again. Some people raise issue with the fluoride in tap water. It's a personal choice. Even being from America and having eaten at several universities in Florida, I still can't get over how expensive the food on the Texas Tech campus is! The COWamungus meal was the best deal, money wise, this week. WOW! I know you explained the prices before, but it still blows my mind a little. Y'all, Dudes, Dudesses and of course lets not forget CJ, Joy, GJB and Sunflower Gal. A great way to end your week, it has been interesting, fun and informative and I have enjoyed reading all the posts throughout the week. All the best with your studies and again a grand job, Thank you!!! Thanks again to all for your feedback! I've been trying to respond to some individual comments here and there, but I'm pleased that there are too many to reply to them all, so a big, BIG, thanks one more time, and I left my Twitter handle and blog address in the comments from somewhere earlier in the week, so we can always keep the conversation going. Food has always been a unifying factor in many cultures, the cement of society (I should know as I am part French part Italian and I breathe and live food!) and the multicultural take on the topic is a great eye opener to understand the world we live in. Hey Sunflower Gal - I would really like that bagel - sounds really good! Thanks to all from Texas Tech, we've enjoyed your blogging.